Summertime is typically a little slow in the hardwood business, so we’ve decide to heat things up a bit with an old-fashioned open house. Come on by Sat June 29th for a tour and lunch on us. Just as we like premium lumber here at CP Johnson, we also like good food. No Costco trays or cheap hot dogs will be served. How ’bout local, grass-fed burgers topped with Havarti or Artisanal cheddar cheese? You get the picture. While you’re here, pick up some wood for your summer project. 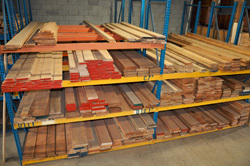 All lumber will be on sale 10% off, and we’ll have a selection of deeply-discounted specials. We hope to see many of our regular customers, and thank you for your patronage . This event will also be a great opportunity for you all who have heard of us but have not yet made the trip out to see us. I’m sure you won’t be disappointed. Click on the C. P. Johnson logo at the top of the page to go to our website. Our special guest will be master woodworker and teacher Charles Neil. Many of you know Charles from his great instructional website, now’s your chance to meet him in person. He will be available to answer your woodworking and finishing questions, as well as just hanging out. Neil is a font of practical information ; and he’s quite a character. – the bargain bin is also 10% off! Copyright © 2012 C.P. Johnson Lumber, All rights reserved. cool, I might just drive up there and grab me a hamburger.